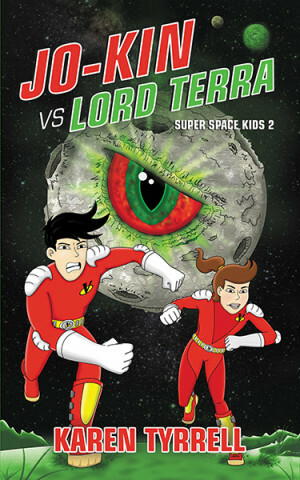 Jo-Kin vs Lord Terra, Super Space Kids 2, sequel to Jo-kin Battles the It. 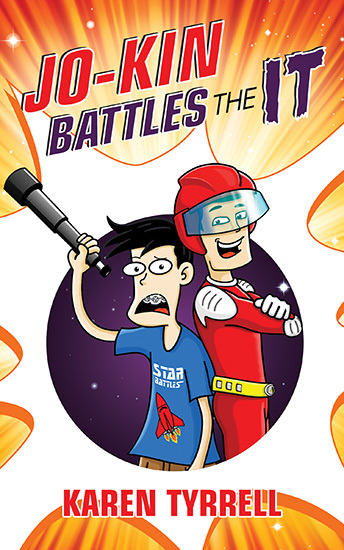 Jo-kin vs Lord Terra is published by Digital Future Press, edited by Penny Springthorpe, illustrated by Trevor Salter, designed by Anthony Puttee of Book Cover Cafe. Thanks to my Beta readers Steve Tyrrell, Alison Stegert and Jacqui Halpin and to my crit buddies from Write Links. Does it attract your attention? Does it create Mystery? 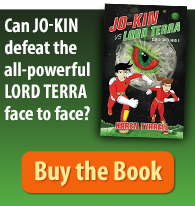 Does Jo-kin vs Lord Terra appeal to you? … and to your kids? 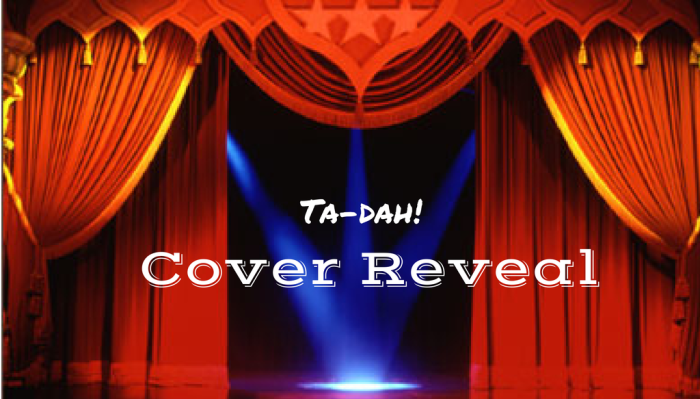 Does the book cover and blurb entice you to PEEK inside? Will the cover STAND OUT on the book shelf? I’m biting my finger nails here … and praying for positive Book Karma. Please let me know!!! PLEASE spread the NEWS to everyone you know. Comment: SHARE on Facebook, Tweet and Google Plus. 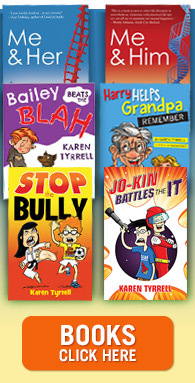 Nice scary cover Karen. The heroes look like they are under the pump this time. Looks like a whole planet bearing down. Cool green colours add nice malevolent overtures. Can’t wait to see it fly off the shelves. Hi Hugh, That was quick! Thanks for taking a peek. I’m thrilled with your reaction and that you “get” it! 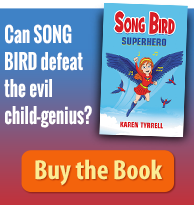 Hi Karen, the cover is very eye-catching and one can see the mysterious element behind it. I love the eye peering out and it makes me want to know why. Well done hon. Good luck!! Wow, Karen! Super-duper double-awesome! Well done and congrats! Brilliant colour choice! Red speaks thrill, adventure. Green for fun. Kids might have to wrestle this one off me. I love the cover design, story-line and wonderful l, well-thought-out teasers for sure! Thanks so much for taking a close look at my upcoming book… and for your very kind words. Thrilled you love the cover design, story-line and my “hooks”. Looks fantastic Karen… all the best with it. Hi Karen. It’s great to be able to see the two books near each other. It certainly is a striking cover. I want to open it up and see what that malevolent eye is all about, and why they are running away. Congrats!! Looks & sounds amazing. Oooh love your words “striking cover” and that you want to find out about the malevolent eye and why they are running away. An eye-catching cover,Karen. Best wishes for the success of this new book. I guess you’ll be working on number three soon.